Anatomy of the salivary glands; drawing shows a cross section of the head and the three main pairs of salivary glands. 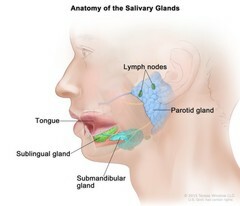 The parotid glands are in front of and just below each ear; the sublingual glands are under the tongue in the floor of the mouth; the submandibular glands are below each side of the jawbone. The tongue and lymph nodes are also shown.